Taxes can be, well, taxing. 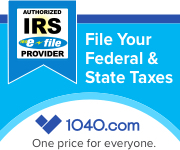 You have a choice to file here online or for just a few dollars more you can come in to our office for a one-on-one interview. .
New client special is $99 if appointment is made before March 30th- this includes federal and state return plus E-Filing included at no additional charge! If passed the March 30th New client deadline; prices vary because it is based off of what forms are needed to be transmitted to Federal and/or State as each person's returns are unique to themselves. No. You can only file your past year return by mailing it to the IRS or state tax department because the IRS doesn't allow electronic filing for past year returns and requires you to sign them. Make sure you don't have any emails from us on block (bulk email or spam blocker can cause our emails to default into a spam folder). How long does this tax preparation process take? We are known for our fast turn-over time. Most returns are completed within the hour appointment. Simple returns can take less than the alloted hour appointment- all you need to do is make sure that you have supplied the correct information. If you have a Federal Refund and E-filed, your Refund can take up to 21 business days according to the IRS.